Firefighters in northwest China had to brave unusually icy temperatures when they came to the rescue of two six year old boys, who fell into freezing waters on Saturday. The youngsters were playing on the river’s thawing surface when they tumbled in and became trapped. Seven firefighters banded together in an effort to pull the boys to safety from the river in Guyuan city in China’s Ningxia Hui region, the China Daily reports. The firefighters broke through the ice one by one, tied together for safety, and eventually reached the children. The rescue operation took place in treacherous conditions including heavy mud, strong currents, and ice-cold temperatures. The river dips to over two meters at its deepest point. However, after 20 minutes the boys were safely back on land. They were taken to hospital and are reportedly in a stable condition. 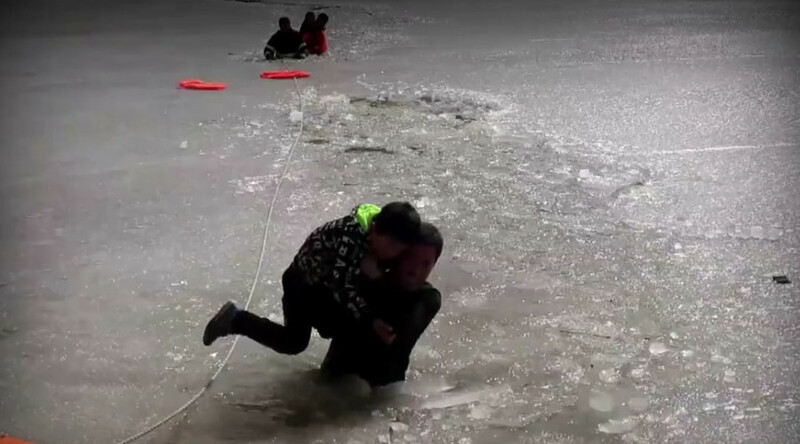 Two Chinese boys fell under the ice on a frozen lake while playing on its thawing surface. It took 20 minutes for firefighters and police to rescue the youngsters. Both are in a stable condition.